We're the people to call for boundary, topographic or control surveys! A boundary survey is the measuring of and determination of the size and physical location of a parcel of land that has been described either graphically (Plat) or in writing (Deed). The boundary survey will be based on the legal description provided by our client. The actual physical extent of property as described extends to the property corners, typically witnessed by monuments or markers, such as (iron rods, pipes, nails or concrete monuments). These markers are measured and compared to other local land lines to verify their location per the legal description. The surveyor will hold existing markers or set new markers based on their calculations. The final boundary survey drawing will include all pertinent land lines, marker descriptions (set or held) and above ground permanent features including (houses, sheds, power poles, concrete, asphalt, etc.). 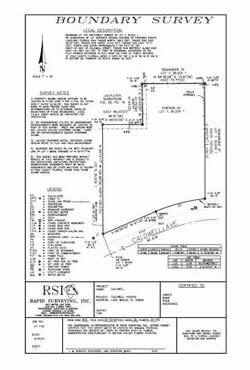 Boundary surveys are needed whenever there is a need to know the physical location of property lines as described in the deed. This can occur when there is a dispute between adjoining property owners, or if a structure is going to be constructed. Engineers need them to set limits for design of construction projects and local agencies require them for permitting. Many times it is also a requirement for a loan or refinance on a subject property. It is important to note that a surveyor producing a boundary survey is not determining ownership, but in fact is placing the boundary lines as called for in the deed on the ground and monumenting those lines for the owner and adjoiners benefit. Rapid Surveying realizes that there are many different types and/or names for various “boundary surveys.” There are also many different reasons and needs for a “boundary survey.” We hope this website will help you understand why they are all “boundary surveys” and that it is in your best interest to have a dedicated and thorough surveyor on your team.